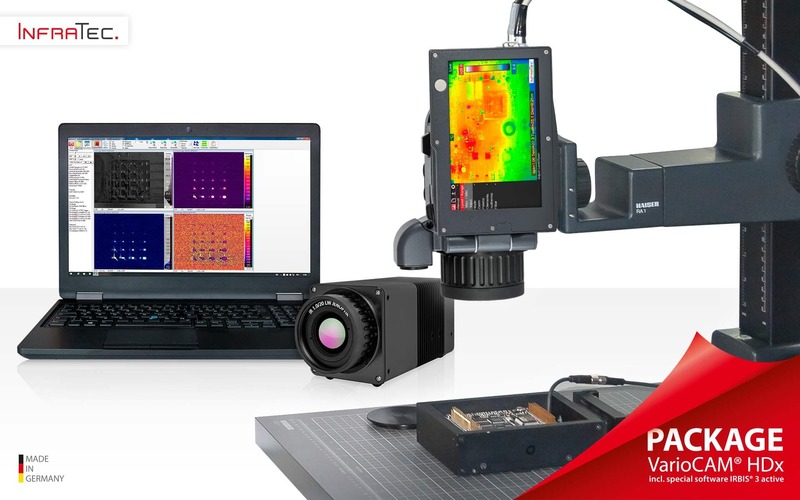 Today many manufacturers of electronic components and assemblies use thermographic cameras during product development. InfraTec is opening up a completely new range of opportunities to such users. A package for Lock-in Thermography gets you off to a successful start in such challenging measurement tasks at an exceptional attractive price. This includes the VarioCAM® HDx thermographic camera – as a stationary or handheld model – together with the IRBIS® 3 active thermography software, the appropriate trigger unit and corresponding connection cables. Lock-in Thermography is used nowadays as a variant of active thermography in connection with scientific issues as well as in numerous research and development departments. The focused induction or generation of a heat flux is a way of examining test objects non-destructively for concealed material defects, cavities, cracks, joint flaws or delamination. In electronics, developers use the method for detecting faults and anomalies in the development of electronics, since a focused input of heat can usually be attained easily by means of electrical excitation. Even in the case of the slightest power losses, errors can be reliably detected and localised. This effectiveness is directly linked to the qualities of the VarioCAM® HDx. Its large microbolometer detector offers (640 × 480) IR pixels. The available range of light-intensive precision interchangeable lenses includes the standard lens, a macro lens as well as a high performance microscopic lens, which enables to depict structures with a pixel size up to 17 μm. In view of the extensive range of lenses, users can operate individually at varying working distances and adapt tests conveniently to different measurement objects and tasks. The GigE interface ensures that a transmission of very detailed images is possible in real time. Optional interfaces to LabVIEW and MATLAB as well as a software development kit facilitate the integration of the thermographic camera into existing system environments. A second key component of the packages is the thermographic software IRBIS® 3 active. This modern and all-purpose tool is specifically tailored to active thermography. It supports analyses, in which the temperature differences between defective and intact structures are extremely small. Complex evaluation algorithms form the basis for gaining conclusive results. The large data volumes that frequently occur here can be processed automatically with the software. In all, the package constitutes a powerful solution for basic analyses using Lock-in Thermography. The emphasis here is the integrated use of the thermographic camera. The basic equipment enables users to already achieve convincing results from the start. Upon request, they can configure the entire thermographic system even more flexibly with regard to their specific needs. The modular design ensures long-term flexibility and the certainty of being able to respond to new challenges at any time.